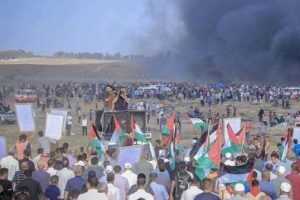 The Palestinian Health Ministry has confirmed, Friday, that Israeli soldiers killed one child, and injured 220 residents, including one journalist and two medics, during Great Return March protests in the Gaza Strip. The Health Ministry said an Israeli army sniper killed the child Othman Rami Hallas, 15, with a live round, east of Gaza city. The child is from the Sheja’eyya neighborhood, east of Gaza city. 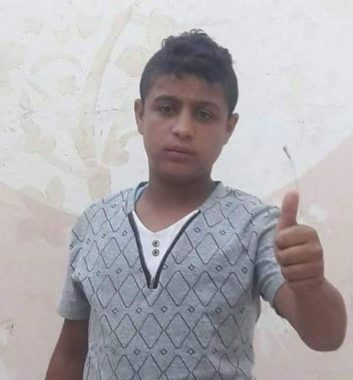 A video of the incident showed the child, along with other Palestinian protesters, near the border fence when the Israeli army sharpshooter killed him as he was held the railing of the fence, installed on Palestinian lands. In addition, the soldiers injured 220 Palestinians, including two medics, and one journalist identified as Mo’in ad-Dabba, in the Gaza Strip. The Health Ministry said 55 of the wounded Palestinians were rushed to hospitals in the coastal region, and added that 165 others suffered the effects of teargas inhalation. At least one protester was killed and about 68 others were injured by Israeli forces on Friday, as hundreds of protesters made their way to the Gaza-Israel border as part of the ongoing Great March of Return protests, demanding their right to return to their homes in pre-1948 Palestine. Soldiers manning the border fence fired live bullets and teargas canisters towards the protesters, who gathered at many encampments along the border, killing Othman Rami Hilles, aged 15, and injuring at least 68 others by gunfire. Other protesters, meanwhile, sustained suffocation as a result of teargas inhalation, according to WAFA. Over 137 Palestinians were killed and some 15,000 others injured, since the outbreak of the protests, on March 30.